Here at StickerYou headquarters, we love seeing all the interesting custom product labels that people have designed and imagine all the different applications they are being used for and who will be using them and where. Recently, a great client of ours announced he is going to be on Dragon’s Den to sell his product, the FixMe Stick to the dragons. Way cool. Corey Velan and Marty Algire’s FixMe Stick is the first ever consumer usb device that will remove viruses from infected PCs. And for those of you who don’t know what the Dragon’s Den is; it’s the highest rated unscripted Canadian program during which entrepreneurs and business owners present new products or ideas to a board of very successful businessmen and women (a.k.a, the Dragons) in hopes of gaining some financial backing and mentorship. The show has more than 1.2 million viewers each week. We are super excited that Corey and Marty will be on the show. Especially exciting is the fact that when Corey and Marty go live, some StickerYou labels will have their first-ever shot in the limelight of TV! 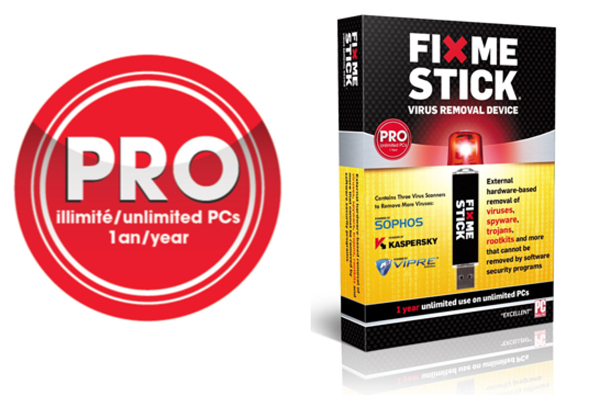 That’s right, as seen above, the packaging of the FixMe Stick has a red label on the front that says “PRO, can be used on unlimited devices for a year”. This label was made by yours truly- the StickerYou Sticker Crew- and is now hitting the screen (we’re so proud!). Sticking them on the outside of a package to promote a specific feature or bonus offers is yet another great way to use stickers. It is a fast and effective method for catching the eye of consumers and sending a message about your product. One of the great things about StickerYou is making such stickers is simple and affordable. If you already have a design in mind, you can upload it to our site or choose and customize any of our hundreds of templates. You can also order stickers at any size and any quantity you like. So if you only have 10 packages you want to add a sticker to, we can help. If you have 20,000 boxes you want to sticker- bring it on! Check out Dragon’s Den on CBC Jan. 15th at 8pm to see Corey and Marty and their FixMe Stick, or check them out at FixMeStick.com.